Opening Tuesday, June 6 at Cooler Gallery, 7 pm to 10 pm. On view through June 30. Artist Huy Bui has a penchant for constructing environments, and his latest creation to be brought to life at Navy Yard-adjacent art space Cooler Gallery is timely in its name: A Structure For Hope and Survival. 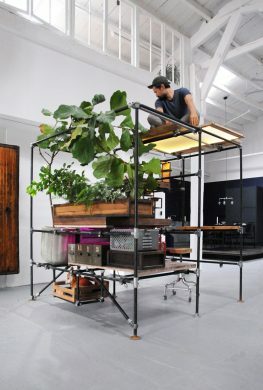 Deemed a “framework of organizing artifacts, objects, art, tools, books, games, supplies, seeds, plants and provisions,” this “modular ecological unit” serves as a structure and container for anything you might need, from plants and seating areas to how-to books and emergency snacks. An artist statement indicates that a manual is in the works for anyone who might want to build one themselves. The opening reception on Tuesday will begin with a panel discussion entitled “Art and Architecture in the Anthropocene” with Bui, fellow artists, and people who have worked on projects like Playlab and the Lowline. Opening Monday August 22, 6 pm to 9 pm at The Living Gallery. On view one night only. 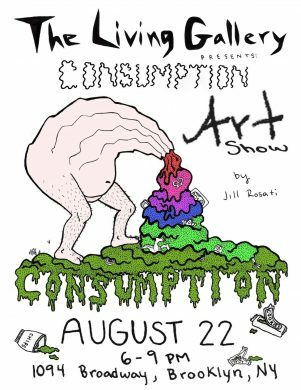 For one night only, the humble Living Gallery will be taken over by artist and “earth-loving dumpster-diver” Jill Rosati’s fantastical sculptures. Among them are “vomcanoes,” vaguely grotesque creations that look as if a mound of dirt grew legs and eternally spewed a fine stream of luminescent sludge that may or may not contain human hair. Yum! Rosati is committed to showing the ugly and excess-filled side of human nature (and sometimes, just nature itself), but smartly does so using sustainable and recycled materials so she doesn’t necessarily waste in order to portray waste. The last time we saw Nasa Hadizadeh of Alt Space– the IRL art and fashion hub of Alt Citizen– it was January and she and her crew were so, so ready to cram their stuff inside a baby blue short bus and escape winter early by way of an enviable jaunt across the country. That’s exactly what Alt Space did after closing down its Montrose Avenue incarnation. Now, after a few months and some bumps along the way (including a broke-down bus), they’ve returned to Brooklyn with a whole new lease on pop-up life. Walk into Bushwick’s SIGNAL Gallery and you might feel as if you’ve just stepped off a spaceship onto the surface of some distant moon. A thick cloud of fog dominates the room, and strangely its opacity seems to vacillate as you move across the room from painting to installation to sculpture. It can be disorienting but also sort of zen inducing, though the gallery cat doesn’t seem to be bothered one way or the other. An exhibition curated by Bennet Schlesinger, Fissure: Fog, installed the cloud here at SIGNAL when it opened nearly two weeks ago at what’s become one of Brooklyn’s premiere galleries for emerging artists. Fissure features work by local artists including Nikholis Planck, Aidan Koch, Graham Hamilton, and Kayla Guthrie, among others. The works draw from a variety of mediums and artistic practices. We can say without hyperbole that this is by far the coolest thing that will ever happen in the history of mankind. This Sunday, experimental/weirdo/brilliant musician Sean Nicholas Savage is bringing his signature awesome weirdness to Signal gallery in Bushwick. Savage is a performance character of sorts (like Boy George, but hipper) who first rose to infamy in the illegal after hours scene in Montreal (the same scene that gave birth to Grimes).